These are animals that Dr. Mark has worked on and made miracles happen for them. Lots of love, patience and therapy had these babies walking or flying again. Dr. Mark working on Officer Gaylon Music’s beloved police dog Brutus. Dr. Mark working on a rescue horse that had severe head and neck injuries. The owl had hit a windshield and had obvious damage to its neck because it was literally turning its head upside down. After one adjustment he was able to rotate his head “upright” again! 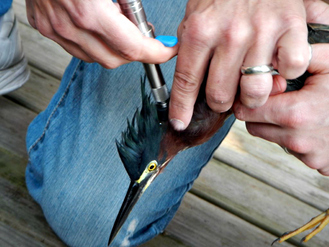 Dr Mark helping a Green Heron! Our friend Steve Dandrea, a senior student in Environmental Sciences with a large background in Marine Biology found this beautiful Green Heron. It seems to have somehow flown into the side window of a building. He called Dr. Mark to see if he could help. On the first visit the bird’s head was twitching and tilted to the left. It was not able to walk well or fly, and was also having problems eating and cleaning itself. 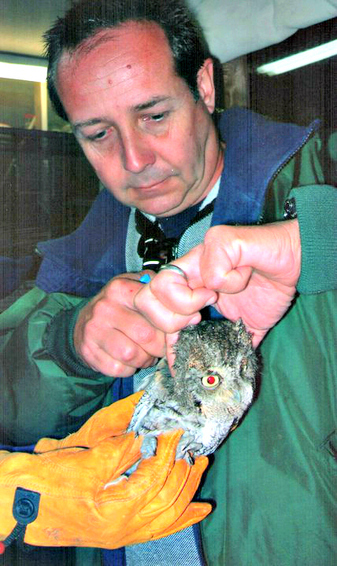 When Steve held the bird for Dr. Mark we noticed that it’s right claw could not grab his finger the way his left could. 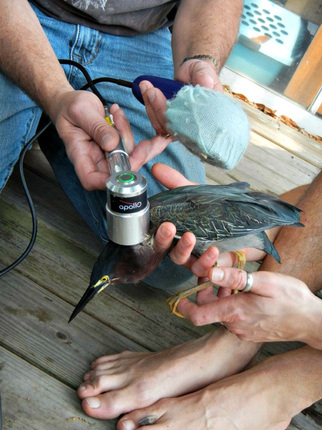 After Dr. Mark did the VOM adjusting technique on the bird, he started utilizing the physical therapy modalities of both laser and the alphasonic “CHI” machine. The bird started to stretch his neck out during this part of the treatment, and after a few minutes Steve noticed he was grasping his hand better with his right foot. He became so comfortable that he seemed to “melt” into Steve’s hands!! Happy birdie!! Today on his second visit, Steve mentioned to Dr. Mark that the bird was now eating on his own, able to clean itself, walking on his own, and was opening both wings up and sunning himself. The head tilt was now gone, as was the twitch, and the bird seemed to have more energy! Crossing all “claws” that soon he will be able to be released on the beach of Treasure Island and fly fly fly!! Pictures of Duke the 13 year old GSD that Mark worked on and started on Super HBA Plus. Changed his diet also. First picture was the day he was pulled 2/23/2013, second was 7/18/2013 when we started the HBA and switched foods, the third was 8/29,2013. 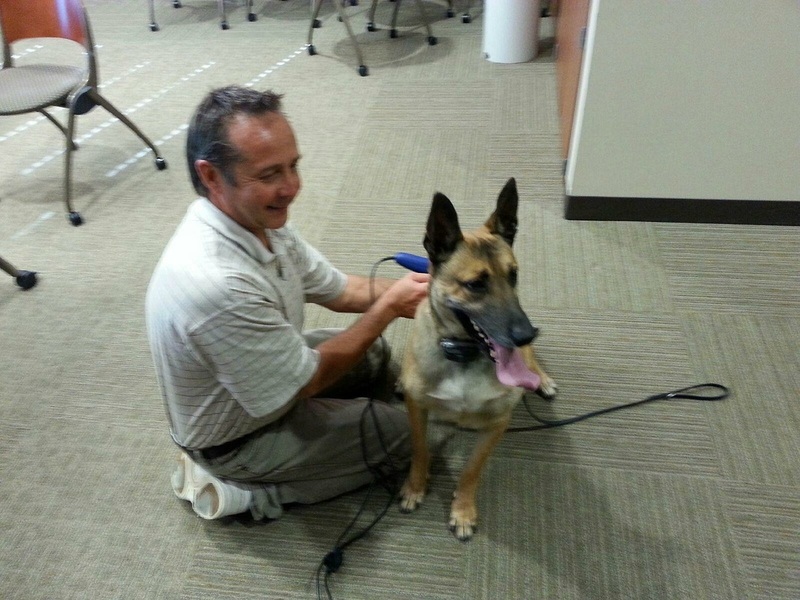 Southlake Police Department has officially hired Dr. Mark Bussan to work on their injured Police dog Ruckus!